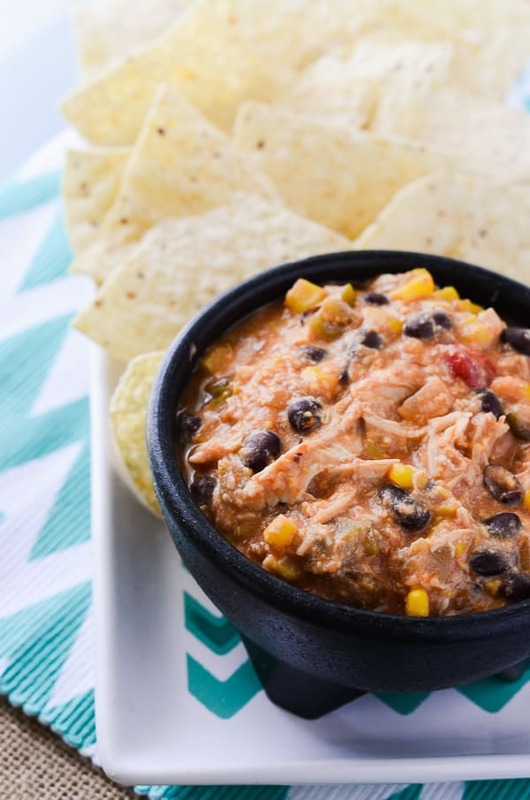 Dinner served up as an easy appetizer – this chicken chili dip is a scaled down version of the main course, cooked in the crockpot with only 5 ingredients! Happy Sunday, folks! I hope you’re all enjoying time with your families, or if you’re working (like I am – its graduation weekend here in CFLA), at least not working too hard! Yep, it’s Sunday, and here I am with a new recipe…that means it’s a #SundaySupper week! Get used to these, folks, because I’m really enjoying the challenge that participating in these special roundups presents me. This week, we were asked to share our best 5 Ingredients or Less recipes. My dear friend Gretchen gifted me with a mini Crock Pot a few weeks ago, and when I opened it, my brain immediately started putting together a list of things I could cook in it. I use my large slow cooker quite often for soups, chilis, and casseroles, but I’ve never had a mini-sized one, and have always wanted to try making small crockpot desserts and appetizers. It hit me as I drove home from our Painting With A Twist session that night – I knew just what to make first. In spite of the fact that our afternoon highs are nearly hitting the nineties, Crockpot Chicken Chili Dip sounded so perfectly appetizing for a night of bingeing on Game of Thrones with Mr. Crumby. This is my favorite dip, and the funny part about it is that it’s actually a variation of a regular chili recipe I got from another friend. She brought it in for a charity chili cook-off at work and, much to her dismay, we jokingly referred to it as a chili dip. So here I am, presenting it to you as such, with a couple of slight changes. I love how easy it is to make! I usually use deli rotisserie chicken in it, but you could use any kind, even leftovers! 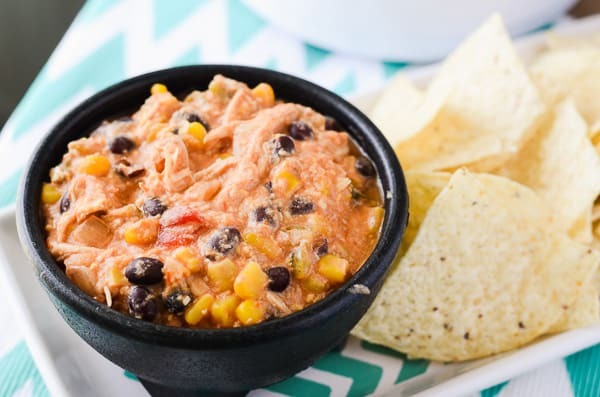 You just mix it up in the crockpot with some zesty lime juice, your favorite salsa (mine happens to have black beans and corn), a heap of sour cream, and a mountain of cheese. The measurements in the recipe are just what I used, but I urge you to add however much you want of any of the ingredients! I never say no to more cheese, personally. In a couple of lazy hours, you’ll have a yummy appetizer that’s perfect to share around your #SundaySupper table! And I don’t know about you, but I’m all about food happening even while being lazy! Place all ingredients in a 1.5-quart crockpot (or any size, but it fits perfectly in the mini! ), and stir to evenly distribute. Cook for about 2 hours, or until everything is nice and melty and delicious. Serve with tortilla chips, or in a bowl if you just feel like chili! What’s your favorite crock pot party food? And since it’s #SundaySupper, how about taking a look at all the other super simple 5 Ingredients or Less recipes floating around the web today!? What an easy and tasty appetizer for a party. Nothing like an easy crockpot recipe! Looks tasty. You’d never guess that you could make this with only 5 ingredients! So cheesy and irresistible!!! Dips like this are totally up my alley! I had a mini crock, and then I dropped the lid and I was so sad! I need a new one for dips! YUM, I need to stop reading these posts before I have breakfast. Now there is drool all over my laptop. I love how easy this sounds. Almost too good to be true. Now I want a mini crock pot. 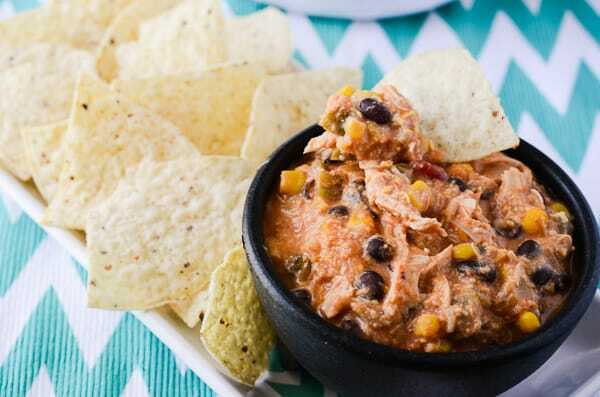 Love this chicken chili dip. I love that this is made in the crockpot! And it would be wonderful all year round. I know it’s waaaay early for super-bowl, but this would be perfect for a super-bowl party!! What a great idea. I love 5 ingredients or less. Most of which I already have in my kitchen. WOW! You just put all my favorite words together in one title. Crockpot. Chicken, Chili, and Dip! Sounds amazing! Wow! This looks amazing! I love a good, crock pot dish! It would be perfect anytime of year. 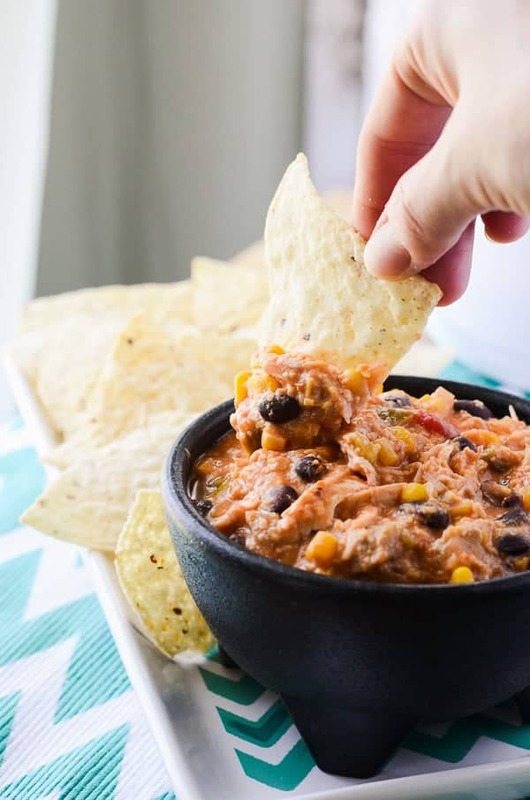 We love crockpot chili dip! It is so easy and everyone loves it! Wow this looks so good and easy to make! I love using chicken vs beef in chili. My fiance has a crock pot so I am collecting recipes! Love that this is made in the slow cooker!! Cool idea for a dip! Al the good stuff is in there! I can totally see myself making this for a fall football party! Perfect portion and looks fairly doable for most skill levels! 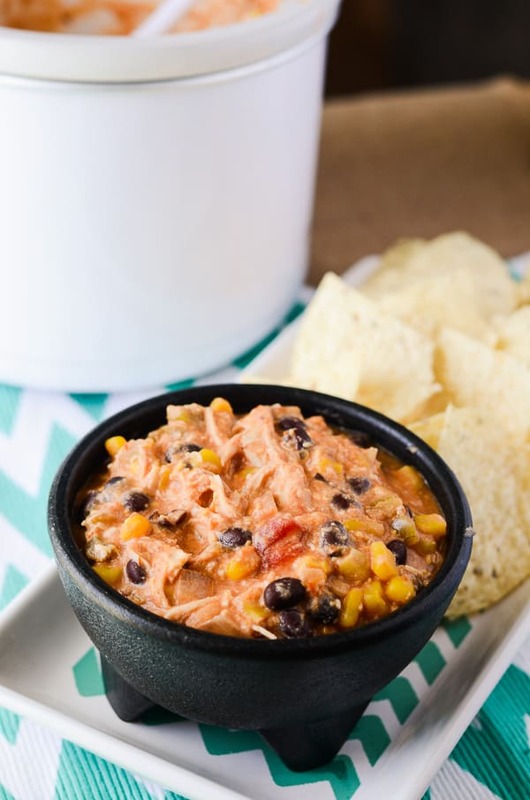 I LOVE this – next football season I’m changing up our dip and giving this one a try! This is great! We got a slow cooker for our wedding and I am always looking for new things to make! I pinned this, because WOW. Looks so absolutely yummers. And a mini crock pot?? Too cute! Love those mini crocks 🙂 This dip sounds like a great party item! Such a great crockpot recipe for dinner! The dip will surely condition our tummies. It’s so irresistible!